Rachel Chambers, 51, and Emmitt Grimm, 64, are surrounded by their possessions packed in garbage bags on Wilson Avenue in Uptown Tuesday. 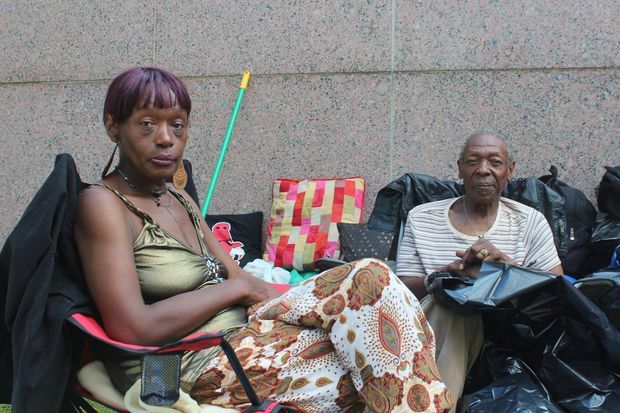 UPTOWN — Living under a dilapidated bridge doesn't guarantee you many things. 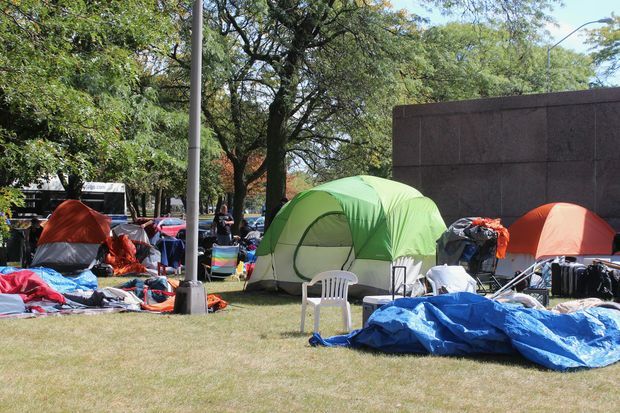 What it did grant Uptown's tent city homeless was a concrete barrier from the elements. "It's definitely better under the viaducts. You don't have to worry about the rain. Out here, everything is different. You're battling the wind too," said 64-year-old Emmitt Grimm, one of the tent city holdouts. Over the last 72 hours, the tents have slowly disappeared from under Lake Shore Drive as viaduct repairs were set to begin. With eviction looming, Tent City's residents moved from under the Wilson and Lawrence avenue viaducts, setting up their temporary homes on parkland just east of the Wilson viaduct instead. But that spot wouldn't last. Police officers and Chicago Department of Transportation officials warned the homeless Monday that the new tents lined up on Wilson would be removed because they were erected on an active construction site. By Monday afternoon, Streets and Sanitation crews removed about a dozen tents from the new site, tossing them in flatbed trucks. The 25 or so residents who refused to head to a shelter Monday night battled overnight rainfall and chilly winds. "It was raining so bad I was taking a shower in it," said Grimm's girlfriend, Rachel Chambers, 51. The couple slept under the Wilson viaduct for about a year, they said. On Monday morning, the Department of Family and Support Services identified Grimm as an Army veteran, one of their focal points for housing. But Tuesday, he remained on the streets. Officials promised him housing opportunities, but they required him to leave his girlfriend or first move to a shelter, Grimm said. Neither is an option he's comfortable with, he said. "I don't want to sleep in no shelter. Not Cornerstone [Community Outreach]. I've been there, done that," Grimm said. "I need a crib. I don't need to go to this place or that place." Permanent housing is not an option for Grimm at the moment. Like the other remaining tent city residents, who didn't scatter across Uptown or take the offered ride to shelters, he doesn't have much of a plan. After spending Monday night in the parkland next to the viaducts, city officials began "tagging" the remaining tents on the parkland for removal and encouraged the remaining people to head to shelters Tuesday. At 5 a.m. Tuesday, Edward Elliston, 59, woke up to begin his job distributing flyers around the neighborhood. When he returned to the site about noon, his tent, backpacks, mattress, plastic bags full of his clothes and employment papers were all missing, he said. "I came back this afternoon and everything is in disarray," Elliston said. The tents were again placed in flatbed truck by city crews, said Thomas Gordon, who had been watching over some of the residents' belongings. Tagged items and tents can be picked up at the Department of Family and Support Services North Area office, 845 W. Wilson Ave. in Uptown. The office is open from 10:30 a.m.-noon and from 2:30 p.m.-4 p.m., a city representative said. "We lost four [tents] this morning," Gordon said. "I had a guy just come back from work, and they took his tent. Everything he owns is in that tent. That's not a good thing." After warnings from police and city crews Monday, the tent city homeless took over an open area in front of a Water Department building just a block east of Monday's camp location. The Water Department gave them until Tuesday evening to evacuate the area, Gordon said. "We're still coming up with a solution," he said.